Dad, talk to your baby! 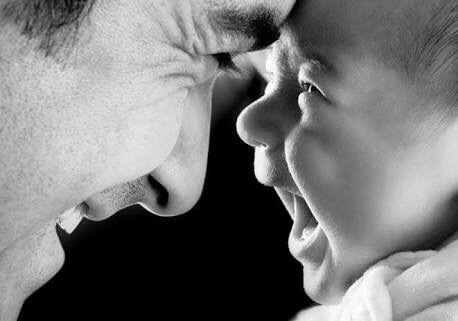 I’ve written before about how good fathering is good for men’s health and vice versa – healthy men make great dads who are present mentally as well as physically. Such positive paternal presence also tends to help families thrive, mums included . So when a baby arrives, it makes sense to support every effort Dad makes to get to know his new little person. I’m now going to address this to dads, but it could help any men in the life of a baby, be they dads, stepdads, grandads, uncles or other friends and family. In fact anyone who wants to help a baby communicate and connect could use the tips below. I’ve developed them in my clinical work with parents and babies, based on my training and experience, both at work and at home as a dad myself! Why? Because long before they get the lyrics, babies get melody. They are wired to respond to your voice, and I think they’re wired to know the tune of a good story, so tell them one. How? With your normal voice, but bevel off the edges. You may naturally find a bit of extra melody in there, but if imitating someone else’s baby talk isn’t doing it for you two, work out your own style by watching your baby’s face. It’ll be a bit like tuning an old transistor radio – you’ll know when the signal is at its best, by the way your baby’s face and body and voice respond. What? Almost anything G-rated, but best if it’s a story. There is something very special about human storytelling that has given us something to talk about for as long as there’s been an us. Stories make sense of our lives, hand on all we learned the hard way, and connect people. I think babies know when they’re hearing an important adult telling a good story; the melody settles their bodies. It’s like evolution telling them: you’re part of this. An adult has you in mind. You won’t be forgotten or left behind. Tell me a story, Dad! If it can be your story, what in my family we call a Dad’s Head Story, that’s best, because your brain and body will probably settle too, as you make sense of your life, even in the smallest ways in the here and now. I’ve made each example of these Dad’s Head Stories fit around common events at the end of a baby’s day. Of course it’s often messier than that, things don’t fit, or you can find it hard to think about what to say in the heat of a moment. Like anything, practice helps – with repetition you’ll likely find your schtick, and your baby will get used to it, finding it reassuring as well as interesting. Use other people’s stories to give both your brains an enjoyable break. You can start reading to your kid in the womb, and pretty much any time after that too. Find kids’ books you like – libraries and their websites have great selections – and away you go. There’s great evidence that reading to your baby every day is good for them, you, and your relationship. Speaking of relationships, a dad who tells stories or reads to his baby is likely to be highly appreciated by the baby’s mum. So it’s win-win, really. My thanks to colleagues and friends who have helped shape this article. © Dr Matthew Roberts and My Doctor’s Handwriting, 2017. Unauthorized use and/or duplication of this material without express and written permission from this site’s author is strictly prohibited. Excerpts and links may be used, provided that full and clear credit is given to Dr Matthew Roberts and My Doctor’s Handwriting with appropriate and specific direction to the original content. I only glazed over the tweet. I find that what was possibly your supposed audience would have done as they would not have time either. That is not meant to be disrespectful. I find the whole idea meaningful and truly a great cause for the future. I congratulate you on having the better future of all as a perspective. It is true to my heart. Thank you. Sussan. You’re welcome Sussan. It’s tricky to reach time-poor adults I agree. Please do share with your networks and we will see how many people this can reach! Matthew.